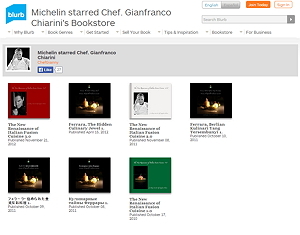 Corporate Executive & Michelin Starred Celebrity Chef Gianfranco Chiarini, has earned the title of the most diverse chef globally. His activities range from, Michelin Restaurants, Super Deluxe Hotels, R&D for the Retail, TV Personality, Book Writer, Restaurateur, Global Consultant and possesses the biggest network of culinary professionals with 15.000+ chefs on his private network at his disposal. 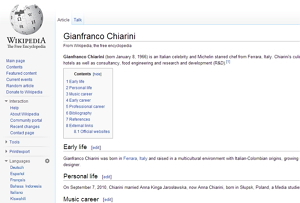 From Italian origins he grew up between Italy, Venezuela and the U.S. He joined the Instituto de Alta Gastronomia de Caracas in the early 90s, from where he graduated as an International Chef. Later, returned to the United States and graduated with a master’s degree from the Pittsburgh Culinary Institute. In Paris, France, he attended the Cordon Bleu, earning Le Grand Diplome Culinaire. Finally in Italy he earned the honorable membership of Executive Chefs of La Gran Accademia della Cucina Italiana. 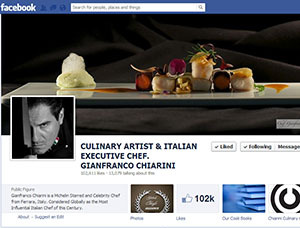 He has worked and trained to Michelin standards under great chefs in Italy and France. 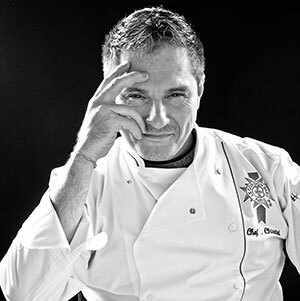 Chef Gianfranco Chiarini has been directly involved in the management, menu designing, prototype and product development, as well as the opening, of luxury Hotels, Culinary Centers and many restaurants in the U.S.A., Venezuela, the Caribbean, Ireland, Germany, Austria, Italy, Netherlands, France, Spain, Portugal, Czech Republic, Kuwait, Oman, Bahrain, Lebanon, Qatar, Dubai, Jordan, Egypt, South Africa, Indonesia, Ethiopia, Turkey, Hong Kong and India. Selected as best chef in the Persian Gulf 2005 & 2006, by the acclaimed “Chaine des Rotisseurs” for their gala dinners. Chef Gianfranco Chiarini has served personalities such as: His Highness Sheikh Jaber Al-Ahmad Al-Jaber Al-Sabah, AMIR of Kuwait (*1926+2006), U.S President Jimmy Carter and his wife, The Presidents of the African Union, Princess Amira al-Taweel and her husband the Saudi prince Al-Waleed bin Talal. Sheikh Hamad bin Khalifa Al-Thani Emir from Qatar, Turkish President Abdullah Gül, Vice President of Iraq Adil Abdul-Mahdi, and many more. Growing up in a multi-cultural family and of course with a rigorous grandmother who taught me the true origin of flavors. This triggered my empathy for good food and it’s in depth analysis even at an early age. Therefore it was inevitable that once I finished high school my destiny was to be in front of the fires, pots and pans. I hate to repeat myself twice. Everything I want and without regrets. Exactly that. Since I live in Poland now it will be Pierogi and Internationally Tagliolini, Butter and Truffles. Approx preparation and cooking time: 2 – 4 hours. Approx serving time: 30 minutes. Total servings on this recipe: 4 persons.  In a Pyrex or ceramic container, place the fish, onion, and tomatoes. Followed by chili, salt, and parsley. Cover with lime juice and olive oil. Protecting with clear film, and place in the refrigerator for an hour. 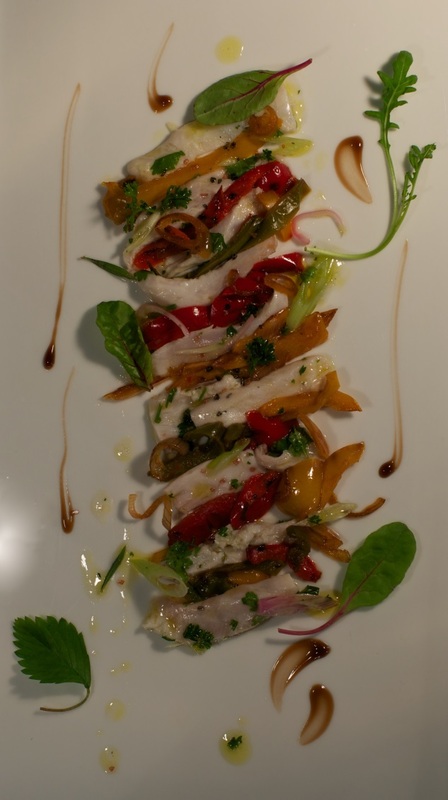  Make a large quantity of the marinating, letting the fish exposed to the acidic lime and lemon juices. Let the flavors and aromas blend for a couple of hours, until it is time to assemble.  Start by slicing the peppers in half, scooping out the seeds and julienne. On a medium, nonstick pan add a tablespoon of the olive oil, and apply heat.  When the oil is warm, add the onions, a dash of salt and sweat for 15 minutes, stirring from time to time.  Once the onions are soft, and translucent, add the garlic and marjoram. Sweat the onions for five more minutes. They should not have browned at all. Proceed now to integrate the peppers and stir to combine.  Pierce the little tomatoes with a small knife and add to the pan, squeezing softly between your hands to release their juice. Place a lid on the pan and simmer at low heat.  Continue simmering, until the peppers are soft, and almost falling apart. Drizzle over, the rest of the olive oil, add the basil leaves and set the salt and pepper, to taste. It will need salt and pepper. Keep semi-warm until assemble time.  In a food processor, place all the ice cubes first at the bottom. Combine all the ingredients in the food processor on top of the ice cubes; process until smooth. Cover and chill. Be ready to assemble.  Let’s begin with the assembling of this highly attractive and contrasting dish, yet rich in colors, flavors, proteins and nutrients.  Full of freshness and energy. Definitely, a summer dish without a doubt.  Take a deep bottom shaped plate, and start assembling frontal layers, as if it was a painting. First start with the Ceviche, then peperonata, and so on as shown.  Now proceed to mix well your Ceviche juices/Gazpacho chilled and pour slowly on the plate without exaggeration or over flooding the ceviche. Enjoy it cold, as it is and have a pleasant fruity Sauvignon Blanc, 2005 or 2008. Just lovely! NOTE: The Atlantic bonito, Sarda, is a powerful (mackerel-like fish), from the family Scombridae. It is an important business and game source, commonly found in shallow waters of the Atlantic Ocean.